I got back from my Christmas trip well over three months ago so this post is uber late, but I thought I would post it anyway in case you’re ever thinking about going to Disney around Christmastime. I really enjoyed this trip so that also influenced my decision to post this to share the joy of the trip. This was my first time going to Disney World around Christmas, and I have to say this is probably my new favorite time to go to Disney. I don’t think I’ll ever forget this trip because it was so amazing! Of course, the first day of any vacation involves traveling to the destination. Because of the great flights we picked, my parents and I arrived in Orlando around 10:30 in the morning so you can imagine how early in the morning we left home. And after a hour drive, we finally arrived at the Grand Floridian for our stay. I was so excited because it was the first time I’ve ever seen the Grand decked out in all of its Christmas glory. And glorious it was. Every Disney hotel has a giant tree in the lobby that matches the theme of the hotel itself. At check-in, our hotel room was ready, which ended up being a slight upgrade. We also grabbed some lunch, which included my favorite flatbread, from Gasparilla’s Island Grill. Our evening plans involved exploring the newest addition to Walt Disney World: Toy Story Land! I have been so excited to visit this world since it was announced (even though I’m still said they got rid of the Studio Backlot Tour). After filling our tummies on the great food, we headed over to Hollywood Studios and had our first glimpse of Toy Story Land. I was amazed! It really did feel like you were shrunk to the size of toys and transported into Andy’s backyard. We only spent a little bit of time in Toy Story Land as we had FastPasses for the Muppets and Indiana Jones Stunt Spectacular. I absolutely love watching the Indiana Jones show, and it never seems to bore me after all of the times I’ve seen it. We then returned to the land of all things toys for our last FastPass of the day, Toy Story Mania. This is one of my mom and I’s favorite rides at Disney. We then tried out Woody’s Lunchbox, which has grilled cheese, brisket, and turkey sandwiches. It’s probably one of the best quick service restaurants in Hollywood Studios. Because of the popularity of the new rides in Toy Story Land, I couldn’t get a FastPass for Slinky Dog Dash so we decided to wait in line for it. Let me tell you, it was totally worth the hour and a half wait. Even my dad thought so and he hates waiting in line for rides. If you go on it, you have to go on it in the dark; it’s amazing! To finish out our day in Hollywood Studios, we watched the Christmas show, Jingle Bell! Jingle Bam!, which was really cute. It followed two of Santa’s elves on a quest to find Santa in time for Christmas. By the time the show was over, Hollywood Studios was closed and everyone piled out of the park. Honestly, I’ve never stayed until park closing so I wasn’t fully prepared for what ensued. It was really cool walking out of the park as snow fell on Sunset Blvd. But once we got out of the park, we found out the worst part of waiting until park close to leave: the wait for buses back to our hotel. Buses can only fit so many people on them and they were not coming to the park as quickly as they needed to. However, our jammed packed first day was a success! Most of our plans for this trip occurred at night so the daily experience during this trip was very different. We woke up later and didn’t get to the parks until the late morning/afternoon. Our second day started with some great gluten free Mickey waffles from Gasparilla Island Grill as usual and an exploration around the Grand Floridian to see all of the Christmas decorations and the gingerbread house. As of recently, it seems that we always go to Epcot on our second day in Disney World. Because of our lunch/dinner plans, I scheduled our FastPasses earlier in the day for Living with the Land, Soarin’, and Journey Into Imagination with Figment. I loved how Disney took the whole theme of Christmas to heart in its decorations of Living with the Land. Poinsettias were abundant throughout the ride, along with reindeer ears, presents, and Christmas trees. Disney’s level of detail is always on point. We then made our way over to the World Showcase for our dinner reservations at Biergarten as a part of the Candlelight Processional Dining Package. My parents and I had never eaten there before because we’re not super big into buffets, but thought we would give it a try as it was one of the cheaper dining plan options and other people had given it good reviews. We arrived and were promptly seated at a communal table with two other parties. When we made our reservations, I had indicated that I eat gluten-free, and shortly after being seated, one of the chefs at the restaurant came over to our table to discuss the gluten free options in the buffet. Surprisingly, I could eat a majority of it, and the chef informed me he would provide me gluten free dessert options when I was ready. I super enjoyed the food at Biergarten, as did my parents even though my dad isn’t the biggest fan of buffets. The buffet consisted of meat, fish, potatoes, applesauce, pasta, salad, vegetables, etc. that were frequently refreshed and tasted amazing. At the top of every hour, the oompa band came out to perform for the guests. We were seated as close as you could get to the stage so we had a great view of the show. I found this really transported you into the having dinner in a courtyard during Oktoberfest vibe. Although I’m generally shy and reserved person, I found it fun to sit with other families at dinner and have a more communal vibe than normal dinners. After dinner was over, we wanted to make sure that we got a good spot in line for the Candlelight Processional in order to get good seats. Of course what that really meant was my mom and I went shopping in some of the nearby countries while my dad held our place in line. And by then, it was 5 pm and time for the Candlelight Processional to start. If you don’t know what the Candlelight Processional is, it’s a show where a celebrity narrator tells the story of Jesus’ birth while a Cast Member choir sings traditional Christmas songs (I didn’t videotape this because I really wanted to stay in the moment for the show). We had the great privilege of seeing Gary Sinise narrate the show. It truly left me speechless on how good the show was; it exhibited the true meaning of Christmas and was beautiful. If you’re interested in seeing what it’s like, I highly suggest watching it on YouTube. Of course, I had to do everything related to Christmas while at Disney World so that included Chip and Dale’s Christmas Tree Spree. Since it’s Disney, you had to pay for a map and stickers that required you to search every country pavilion for the location of the Christmas wreath that had Chip and Dale with a Christmas decoration. For the rest of the night, my parents and I went on a quest to find which stickers went with each location. After finding all of the correct locations, I traded in my map for a set of Minnie Mouse Christmas cards. For $6, it was a fun adventure that allowed us to see all of the holiday decorations for each country. On our way out of the park, we stopped by the Character Spot to see Joy and Sadness, who are both so adorable (Sadness loved that we had on similar sweaters), and went on Soarin’ for the second time. That rounded out a great day at Epcot, where we got to see everything we wanted to except for some of the holiday performers. When planning our trip to Disney World, I had a plan to mimic what would be our plans for Christmas Eve and Christmas Day since we were there the week before. Normally, we keep our Christmas Eve traditions more solemn and religious and then bust out the secular traditions on Christmas Day. So that meant the only thing to do exactly one week before Christmas was to attend Mickey’s Very Merry Christmas Party. And the party is an all-night experience so we took our time getting ready this morning and grabbed some breakfast at the Grand prior to heading to Magic Kingdom. The gingerbread house actually sells gluten free breakfast breads so of course I had to try one of these. I had the apple-cranberry bread, which is made at Erin McKenna Bakery, and it was sooo yummy. We got to Magic Kingdom a few hours before the start of party so we took advantage of those hours with our FastPasses for Big Thunder Mountain, Splash Mountain, and Seven Dwarves’ Mine Train. We also had a quick late lunch at The Plaza Restaurant, where I had my favorite salad, their Chicken Strawberry Salad. My dad and I also took advantage of the All You Can Drink milkshakes for $9. This might sound like a bad deal but when they say all you can drink, it really is all you can drink. In addition to the full glass, you also get a metal overflow tumbler, which is about two more refills of the glass, and then you can even ask for more! That’s probably the only thing I think is accurately priced at Disney World, especially if you split it with someone else, like I did with my mom (I don’t think Disney condones this behavior, but oh well). Then it was time for the party to begin. We headed to the front of the park to grab our party wristbands, which are required in order to stay in the park. One of the first party-related things we did was get our party-specific Sorcerers of the Magic Kingdom cards, which change every year and this year were The Enchanted Tiki Room inspired. To begin the party, we headed to the Storybook Circus to see probably the coolest characters I’ve ever met: The Seven Dwarves in their Christmas finest. We waited for about an hour and twenty minutes to see them, but they’re hidden characters that only come out for parties so we had to see them. They’re super cute and really funny to meet. The most notable parts of the party are the abundance of snacks and entertainment going on throughout the park. We spent a lot of the beginning of the party heading around the park collecting our free treats, including hot chocolate, eggnog, Dove chocolate, various assortments of cookies, and more. To take a break from this, we went on Jingle Cruise, which is the Christmas version of the super punny Jungle Cruise. The Christmas overlay finds our lovely skippers away from home in the middle of the jungle during Christmas time and shows how they celebrate while trying to survive. I highly recommend this ride during Christmas. By this point of the night, a majority of the families with children were leaving the park so we headed to the entertainment for the party since less children meant less people at the shows. We took in the major shows at the castle, like the Frozen castle lighting and Mickey’s Most Merriest Celebration. I thought these shows were pretty cute and super Christmas-y. The first showings of the party shows are highly attended at the first time so it’s easier to find places to watch unless you snag a seat super early. We got to stand right at the stage for Mickey’s Most Merriest Celebration, which was pretty awesome. It was then time for the best part of the night, the Christmas Parade. If you’ve watched the Christmas Day Parade on ABC, it’s the same parade only at night and you get to experience the “snow” on Main Street. We ended up getting seats right on Main Street so we had an unobstructed view of the parade. I find the parade to be even better in person and it was so cool seeing the parade floats up close (btw, the Olaf float is the same one that was used in the Frozen parade in Hollywood Studios a few years ago during their Frozen Summer Fun event). And with that, we ended our night at the Magic Kingdom and went back to our hotel room to get some rest. Because we had a super late night the night before, we ended up getting up pretty late. And since my second favorite hotel at Disney is the Wilderness Lodge, we decided to head over for breakfast and to see what the decorations look like there for Christmas. We grabbed a quick breakfast at Roaring Fork and then continued our tour of the Wilderness. If you’re looking for a Christmas vibe anywhere in the resort, the Wilderness Lodge is definitely where it is at. I absolutely loved their decorations and whole Christmas aesthetic. From there, we took a bus to Animal Kingdom where we had FastPasses for the day. Personally, Animal Kingdom is not my favorite park at Disney World, but I really wanted to see everything holiday related there was to see at the parks. When we first got to the park, I convinced my parents to get a Dole Whip to see if it was any different from the ones in Magic Kingdom and at the Polynesian. Spoiler alert, we found it to be extremely different but still really good. We then went on Kilimanjaro Safaris, which I love because of the amount of animals you get to see and all of the fun facts you learn about the different animals on safari. After we arrived back from the middle of the savanna, we went to see Up! A Great Bird Adventure, which was recently adapted to include characters from the movie Up. For the holiday season, there is a new Diwali overlay to the show, which I really liked to learn about a different religious tradition plus there were a lot of awesome birds that were on display. For dinner, we took an adventure over to the land of Pandora, where we ate at Satu’li Canteen and got chicken and rice bowls again. I think that is a great addition to Animal Kingdom since it doesn’t really have a lot of food options in the park. From there we rode the Flight of Passage ride, which is super awesome and unlike any other ride at Disney World. If you’re an adrenaline seeker, this is totally the ride for you. Because it was winter, it got light outside around 7 pm so I got to see all of the glowing plants and walkways of Pandora. I was a little underwhelmed as it was hard to see even with all of the “luminescence” around Pandora. By that point, the change in weather from where I live, which was freezing, to the warmth of Florida, and the busyness of the past few days made me start to feel a little under the weather. We wrapped up our night pretty early and went back to our hotel for the night. We didn’t really have plans for Thursday during our trip since we had so many plans during the beginning of our trip. It was really a day for doing whatever we hadn’t gotten to do earlier. However, our plans for no plans actually were sadly disappointed because of two things: a tornado watch for the Orlando area and my sickness. I woke up feeling terrible, which is no fun when you’re on vacation. However, it actually wasn’t that bad because we didn’t want to go outside in the pouring rain and wind. So we spent most of the morning relaxing in our hotel room and watching the news for updates on the storm. We then decided to take the monorail around to the monorail hotels to check out their decorations and to go to the Polynesian for a Dole Whip to help my sore throat. On our way back to the Grand Floridian, the monorail broke down so we had to take a bus back to the Grand instead (which tbh, has never happened to me before). Our only real plan for the day was dinner at my absolute favorite restaurant in all of Disney World: California Grill. I always love dinner at the California Grill, and this dinner did not disappoint. The sides for the filet mignon were not gluten free so the waiter suggested that he could switch out the sides for mashed potatoes and seasonal veggies. Umm, those were not just typical mashed potatoes; they were amazing. Although this is one of the most expensive restaurants in all of Disney World, the food there is sooo worth the money. We also split an amazing carrot cheesecake for dessert. To finish off the night, we traveled over to Disney Springs to see the new World of Disney store, which is so modern. I kinda miss the old version of the store because the new one could be any store and not one that’s specifically Disney. We also did some pin trading while we were there to try to finish our collections of the trip. From there, we went back to our hotel for the night. I woke up on our last day in Disney for this trip feeling a tad bit better than the day before but still not amazing. For our last breakfast, we headed over to the Polynesian to finally try out Kona Café. I had heard that it’s a really good breakfast place but we hadn’t gotten there before. My mom and I shared the fruit plate and some waffles while my dad ordered the Big Kahuna (which has pancakes, French toast, eggs, bacon, ham, and potatoes). I loved the fruit plate as all of the fruit was super fresh and tasty and even topped with honey. My dad’s eyes ended up being too big for his stomach as he couldn’t finish all of the food that came with the Big Kahuna, but it’s definitely an amazing secret menu item for $20. We spent our last morning going to Magic Kingdom and riding two of our favorite rides: Buzz Lightyear’s Space Ranger Spin and Pirates of the Caribbean. We also strolled around the park to soak in everything Christmas related and just Magic Kingdom itself. After returning to the Grand Floridian, we stopped by Gasparilla’s for what became my favorite meal of the week: their Chicken and Brie sandwich with raspberry jam and ham. I would eat that sandwich every day and not get tired of it. It definitely did not taste like a quick service sandwich. We passed the time until we had to take the Magical Express back to the airport by listening to the piano player in the hotel lobby and enjoying the giant tree. Unfortunately, my sinus problems didn’t ease up before our plane took off so my ears wouldn’t pop on the flights but other than that, this trip was amazing! I had so much fun on this trip and hope you enjoy my videos of the holiday shows! I know it’s been quite a long time since the holiday season but I hope you enjoyed my recap anyway. Hopefully, for my next vacation, I’ll be quicker with posting my travel blog! Hi! 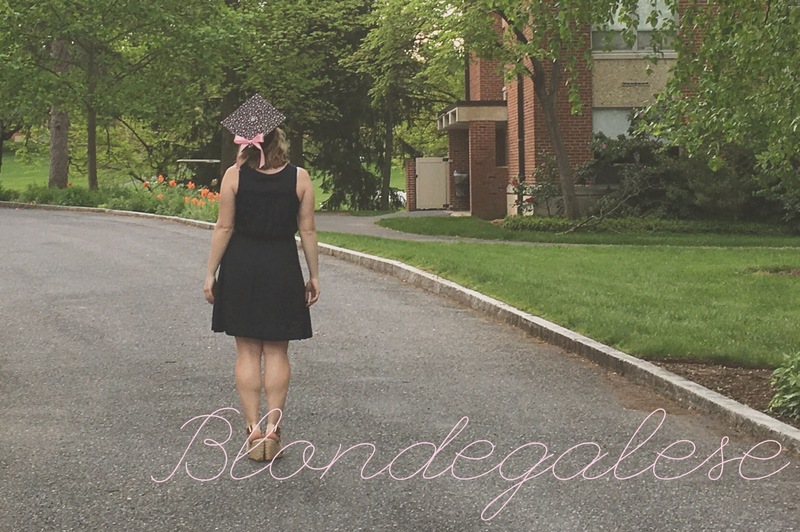 I'm a twenty-something blonde blogging her way through law school! Law isn't my 'Dream Job'..
Blondegalese is a participant in the Amazon Services LLC Associates Program, an affiliate advertising program designed to provide a means for sites to earn advertising fees by advertising and linking to amazon.com.